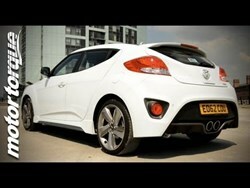 In MotorTorque's recent review, they have put the Hyundai Veloster to the test. The Veloster is Hyundai’s second attempt at cracking the coupe sector. Hyundai has really aimed to make the Veloster stand out against the crowd. The model is a bit quirky and different with its three-door design. An interesting addition to the Hyundai fleet, the Veloster is up against the likes of the Audi TT, VW Scirocco and Peugeot RCZ – but can it keep up with the big boys? The video features acclaimed road tester and MotorTorque editor Simon McBride, who provides a well-rounded review of the powerhouse coupe. Simon rates numerous features of the coupe, such as its sporty interior and the overall appeal of the car.